The square 140mm frame of NF-A14 and NF-P14s redux with 140mm mounting holes (124.5mm spacing) makes them a premium grade replacement for common 140mm case fans and perfect for use on 140mm water cooling radiators, where the square shape will ensure full coverage and best pressure performance. The NF-A15 is tailor-made for use on today’s high-end CPU coolers: While its 150mm width matches those of most high-end heatsinks, its 140mm height doesn’t make it extend on top and thus ensures best case compatibility. The NF-A15’s standard 120mm mounting holes (105mm spacing) also make it an ideal performance upgrade for 120mm case or CPU fans. 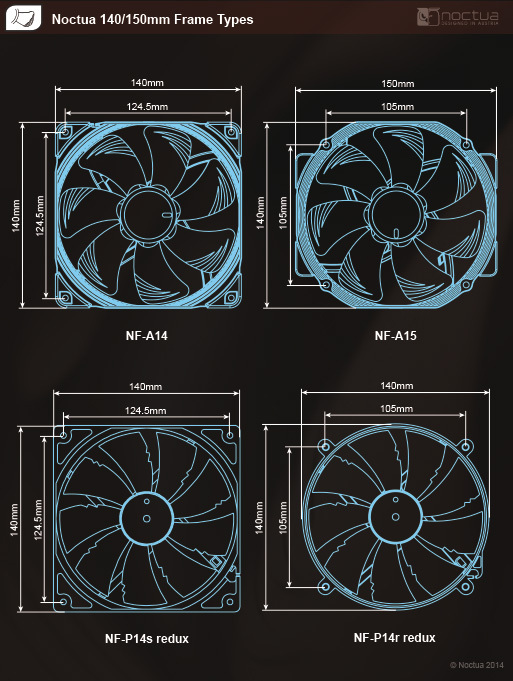 Using a round 140mm frame with the same hole-spacing as common 120mm fans and producing more airflow due to its larger diameter, the NF-P14r is a perfect upgrade for 120mm CPU or case fans.